Space shuttle Atlantis' STS-104 mission in July 2001 delivered the $164 million Joint Airlock to the International Space Station. The module, named Quest, gave the outpost a new doorway for American and Russian spacewalks. The five Atlantis astronauts narrate the highlights of their mission in this post-flight film. The space shuttle Discovery astronauts visit Kennedy Space Center for a practice countdown and emergency training drills. Watch some highlights from the activities. The Boeing Delta 2 rocket launches from Cape Canaveral Nov. 17 on another mission to replenish the satellite constellation for the Global Positioning System. The space shuttle Discovery is rolled to pad 39B for the STS-116 launch to the space station. The space shuttle Discovery is hoisted high into the Vehicle Assembly Building and mated with its external fuel tank and solid rocket boosters. Space shuttle Discovery makes an evening move October 31 from its processing hangar to the Vehicle Assembly Building for mating with an external fuel tank and twin solid rocket boosters in preparation for the STS-116 mission. The objectives of the just-approved final Hubble Space Telescope servicing mission are detailed and the anticipated science from the new instruments to be installed are detailed in this briefing from Goddard Space Flight Center. The crew for the final Hubble Space Telescope servicing mission will be led by Scott Altman, with pilot Greg C. Johnson, robot arm operator Megan McArthur and spacewalkers Andrew Feustel, Mike Good, John Grunsfeld and Mike Massimino. The astronauts meet the press in this news briefing from Johnson Space Center. New images from NASA's Mars Reconnaissance Orbiter show three additional NASA spacecraft that have landed on Mars: the Spirit rover active on the surface since January 2004 and the two Viking landers that successfully reached the surface in 1976. The orbiter's high-resolution camera took a dramatic photograph of Spirit's twin rover, Opportunity, at the edge of a Martian crater two months ago. Besides providing new portraits of these robotic emissaries, the images provide scientists valuable high-resolution information about the surrounding terrain at each site. This aids both in interpreting other orbital data and in planning activities for surface missions. 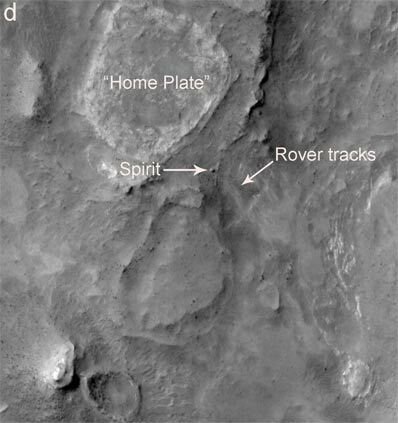 "We know these sites well at ground level through the eyes of the cameras on Spirit and the Viking landers," said Dr. Alfred McEwen of the University of Arizona, Tucson, principal investigator for the High Resolution Imaging Science Experiment camera on Mars Reconnaissance Orbiter. "Applying that knowledge as we view the new orbital images will help us interpret what we see in orbital images from other parts of Mars never seen from ground level." The camera's view of Spirit in the midst of the "Columbia Hills" is quickly being put to use by scientists and engineers who plan the rover's daily activities, just as a comparable image taken two months ago of Spirit's twin, Opportunity, has aided that rover's work. A second image of the Opportunity site has now been combined with the first for a stereo view. The view of Viking Lander 1 from the high-resolution camera on Mars Reconnaissance Orbiter reveals the spacecraft's back shell about 260 meters (850 feet) away and the heat shield nearly four times that distant. The lander returned the first view from the surface of Mars and kept operating for more than six years after its July 20, 1976, landing. "The biggest surprise is that you can still see what appears to be the parachute after 30 years," said Dr. Tim Parker of NASA's Jet Propulsion Laboratory, Pasadena, Calif., whose calculations helped determine where to point the orbital camera for seeing the Viking landers. Viking Lander 2, unlike Spirit and Viking Lander 1, had not been detected previously in images from NASA's Mars Global Surveyor. One feature that had been considered a possibility in an earlier image turned out to be the Viking Lander 2's back shell, about 400 meters (a quarter mile) from the lander easily discerned in the image from the newer, higher-resolution camera. Parker is identifying some individual nicknamed rocks in the Viking-site images that are prominent in famous photographs taken by the landers, such as "Ankylosaurus," a rough rock about a meter (three feet) long near Viking Lander 2, and the larger "Big Joe" near Viking Lander 1. NASA made imaging of the Viking Lander 2 site an especially high priority for Mars Reconnaissance Orbiter to help in evaluation of candidate landing sites for NASA's Phoenix Mars Lander mission, being prepared for launch next summer. Phoenix will land at a far northern site, and the Viking Lander 2 site, though not as high-latitude as where Phoenix will go, is the most comparable site of any seen from the surface of Mars. "The Viking Lander 2 site, with its combination of lander-based and orbiter-based imaging, gives us an important anchor for evaluating the ground roughness and boulder densities at sites where we have only orbital imaging," said Dr. Ray Arvidson of Washington University in St. Louis, chair of NASA's Phoenix Landing Site Working Group. The Mars Reconnaissance Orbiter is managed by JPL for NASA's Science Mission Directorate, Washington. Lockheed Martin Space Systems, Denver, is the prime contractor for the project and built the spacecraft. The High Resolution Imaging Science Experiment is operated by the University of Arizona, and the instrument was built by Ball Aerospace and Technology Corp., Boulder, Colo.